On June 30th at around 10am, the switch was flipped on the iOS 8.4 upgrade that contained the new Apple Music app and about an hour later, Beats 1 went live on the new streaming service. Overall, it’s been a fairly smooth launch from what I gather, and I’ve had a chance to kick the tires on most of the service to report my initial findings. This is by no means a full review, but I thought it might be helpful for people a bit less obsessed than I am with music and especially streaming music services. Like Rdio, Spotify, Google Music and others, Apple Music is a streaming music service that allows users to pay $9.99 a month for the ability to stream any song, on demand, from the nearly 30 million songs in their catalog. In short, you’re renting the ability to play any song or album, when you want it. On mobile devices, users can download and ‘save’ songs, albums or playlists so that they don’t use up their mobile bandwidth. While Apple Music is pretty run of the mill when it comes to this part of their service, they offer a few components that aren’t Earth shattering on their own, but the little differences add up to make something pretty compelling. Apple has had this kinda-sorta cloud music solution called iTunes Match for a while now. Basically, you pay $25/year and iTunes will scan your library, matching the tracks that you own with those in the cloud, and will upload tracks you own that may not be in the iTunes Store catalog. Conceptually, it is pretty solid and I’ve used it on and off over the past few years. You can sync playlists between devices and access all your music on any Apple device you own. However, sync wasn’t always reliable or fast. But for the price it was a pretty good value all things considered. With Apple Music, we now have the iCloud Music Library, which is pretty much the same thing as Match. The thing I loved about Beats Music when I gave it a shot last year was the way they curated playlists based on moods, history or influences and recommended them to you based on what you listened to. I was amazed by how spot on the albums and playlists were, and it was the one service I used that solved the ‘what should I listen to right now?’ problem. Well, the same feature is in Apple Music – the more music you add to your library or love, the better the suggestions will get over time. This is presented in the ‘For You’ section of Apple Music as a series of cards that let you choose from playlists or albums that they think you might like. Over time, these recommendations get really accurate, and I’m always finding something new to listen to (or rediscovering old albums I haven’t heard in a while). You could argue Apple helped kill the radio with iTunes and the iPod but they’re now trying to bring the patient back to life with Beats 1. Basically, it’s an always-on internet streaming station featuring a few prominent tastemakers / DJs as well as shows featuring popular artists that rotate out every few months. Folks like Elton John, Q-Tip, Drake, and Josh Homme all have shows once a week amongst others. It goes along with the other ‘curation’ attempts Apple is making to differentiate itself, and after giving it a go for a few days, I’m way more impressed with it than I thought I’d be. 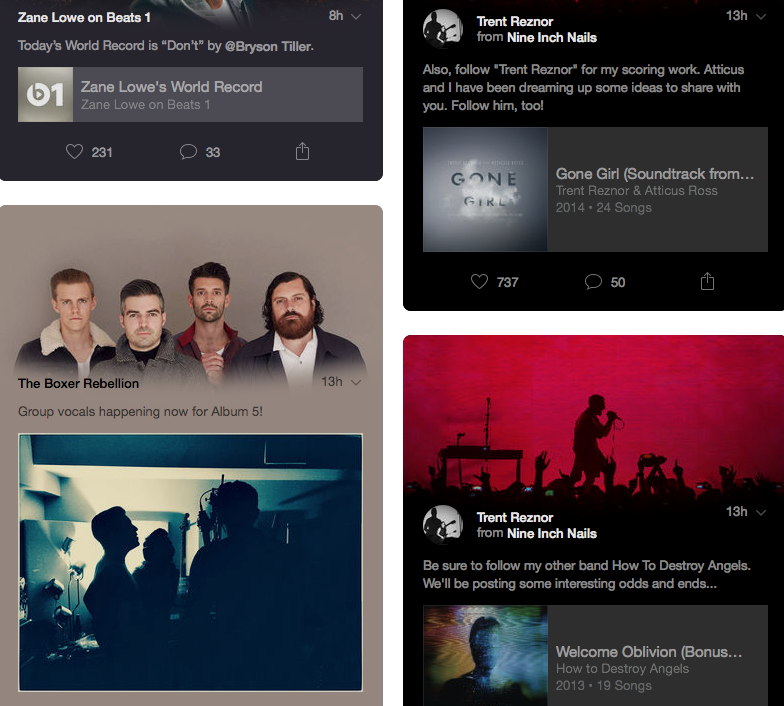 This is kind of like a Twitter/Instagram style service that artists can use to connect with fans. You can allow Apple Music to auto-follow artists in your collection so I’ve already seen a few dozen posts from artists and they range from useless to actually really interesting. Trent Reznor posted some old NIN instrumental tracks that were really awesome to hear and I also saw some cool concert photos. You can imagine this part of the service will either die on the vine or become something much, much bigger over time. I could see this becoming a way to learn about upcoming shows, selling merchandise and promoting other things artists are doing. Further, I could see Apple getting into the ticketing game if Connect takes off. It’s not too far fetched to imagine a scenario in which an artist you follow due to saving one of their albums alerts you to a concert in your area via Connect, and you then use Apple Pay to purchase tickets. The pass is automatically added to passbook, a calendar entry is made on your phone for the event with directions, and you can share you’re going with one tap on Facebook or Twitter, with a link to the same post you saw embedded. Pretty slick if you’re the concert going type, and most of the ingredients are already in place. I had high hopes that Apple would keep smart playlists around and they actually outdid what I was hoping for. For someone like me, this is huge. I like to make playlists based on how often I listen to music or sort by songs I’ve rated highly, etc. Being able to have the music I own and the music from a streaming service comingle like this is perfect. I wasn’t expecting to say this, but Beats 1 is way better than I thought it would be. I figured it’d be a total gimmick – and it still may fall flat as the novelty wears off – but there’s something about that communal experience of listening to music you know thousands of others are also enjoying at the same time. It wouldn’t be worth a damn if the music wasn’t good, though, and the segments I have listened to so far have been really, really good. Not always the exact type of music I’d dig up myself but I’m enjoying it a lot so far, especially while at work. I’ll be curious to see how things mature long term with Beats 1 – do they fill out the roster with more and more shows or do they splinter into a few different stations. Either way, consider me very pleasantly surprised that Radio On The Internet is actually kinda compelling. One thing I’ve seen some people talk about is issues with tracks having DRM on them if you are using the Match portion of the service. Definitely worth backing up your library if you’re going to make the jump. Another stupid thing I blame the music industry for is the fact that you can’t stream Beats 1 to multiple speakers from iTunes. I feel like those issues are, on some level, out of Apple’s hands and I only hold them responsible for poor communication. However, there are some serious UX issues that hopefully can be resolved in time for iTunes 13 and iOS 9, but I’m not holding my breath. The on-boarding process is especially cumbersome, and while I was already used to the way the Beats ‘blob’ thing worked, I kind of hated it already. The software on both platforms is fairly confusing at first to even myself, who I’d consider a veteran of iTunes and Music on the Mac. A lot of folks are talking about how this is Apple’s chance to rethink things now that the dust of the launch is settling, and I agree 110%. Conceptually, they nailed it, but the user experience can be cumbersome. For example, did you know you can ‘love’ anything, regardless of it you have it in your library or not? But, once it’s in your library you can both love/not love a track and also rate it 1–5 stars? I think Apple needs to pick a path and go with it. It’s also not possible at this time to add songs that aren’t in your library to a playlist. Let’s say I’m trying to make a playlist of songs for the beach or for the holidays and I want to add some songs I don’t really want cluttering up my Library. For now, tough luck. This is a two-step process of adding songs to the library and then adding those songs to a playlist I create. When I am listening to a radio station, it’s unclear if pressing the ‘love’ button loves the station or the song. It sometimes persists through the entire radio session. It can be difficult on the desktop to find an artist’s page and just queue up an album of theirs. If I find an album I want to preview before adding to my library, I’m out of luck. I can either press the play button and immediately hear it, or I have to click on the little ‘…’ icon, add the music to my library, go back to ‘My Music’ and then add the album to ‘up next’. Spotify’s UX on this sort of quick discovery is way better, as I’m able to simply right click on anything and ‘add to queue’. Apple seems to be struggling to make iTunes work for people who want to buy their music and those who just want a pure streaming experience. When I’m looking at an artist in my collection and I click on ‘view more from this artist’, I’m taken to the store. As a streaming customer, I’d expect to be taken to a list of all of the tracks in Apple Music, and maybe a link or section at the bottom of tracks or albums I can purchase. Definitely a difficult problem to solve, but this is a UX challenge I hope Apple sits back and addresses for iTunes 13 and Music for iOS 9. In short, I think that Apple’s concept of ‘My Music’ is both very powerful and very confusing. The fact that once a track is in your library it’s just like any other song is pretty awesome. It means you could in theory add more info for a track, rate them, add them to smart playlists and more. However, the downside is that it limits adding songs that you don’t have in your library to a playlist, like in most other streaming services (even Beats Music). Most of these issues don’t apply to the iOS versions of the app, but it’s a bummer that iTunes is such a mess (still). There are also a number of nitpicky bugs that are to be expected from what is essentially a massive scale launch of a 1.0 product. I don’t expect perfection at launch but I do expect they’ll get cleaned up soon. Some of the albums that I have in my collection do not show up as such when I look at a song from a playlist or other medium. On the desktop, that damn ‘disconnected cloud’ icon is the bane of my existence. I usually just have to restart iTunes from time to time to get it to connect reliably. This has been a problem for me sporadically since the Match days, so who knows if it’ll clear up. Adding songs to my library from radio stations has been spotty for me. I was out for a walk tonight and heard a few songs I really liked on Beats 1. I pulled out my phone, clicked the ‘add to library’ button, verified that it was added via the checkbox dialog, and put the phone back up. The next day, the tracks weren’t in my library. Bummer. Double tapping on the icons at the bottom of the iOS app should jump you to the top of the list that you’re viewing. When you click the ‘back’ button on the Mac, I wish it would take you to the exact spot you were viewing instead of back to the top. Persistent state is way easier to nail nowadays, I know this. When you’re listening to a song on Beats 1, a Radio station or a playlist, I wish you could directly add the song to your playlist & that would also add the song to your library in one action. Make it easier to correct issues with ‘Matched’ music. Google Music nails this, as you can upload your own track to replace one that is incorrect, add your own artwork or edit metadata and it actually makes its way through the system. Make it easier to mass clear downloaded tracks/albums/playlists and make it clearer what’s happening. I should be able to right click on anything and add it to ‘up next’ in a consistent, reliable manner. Whether it’s an album, a song or a playlist the behavior should always be there an always work. Apple could have done a better job explaining the service to users as well as taking this moment to simplify much like they did with Photos and iWork previously. I understand it’s a very fine line to walk but this was their 1.0 moment to really streamline what the service does as well as better explain/articulate things. There has been a lot of confusion about how the Match service works, as well as Home Sharing changes that have surprised people. I guess I don’t get why they had to launch this summer – they could have taken their time and announced this when they were really ready. I suppose iOS 9 was the marker they wanted to be live by, but they must have decided to deal with whatever growing pains there were going to be. Most of my complaints are with the fairly poor job that was done thinking about user experience on the Mac and communicating a lot of the differences between Match, Apple Music and Beats Music. From a software perspective, the iPad and iPhone versions are outstanding in most every way. 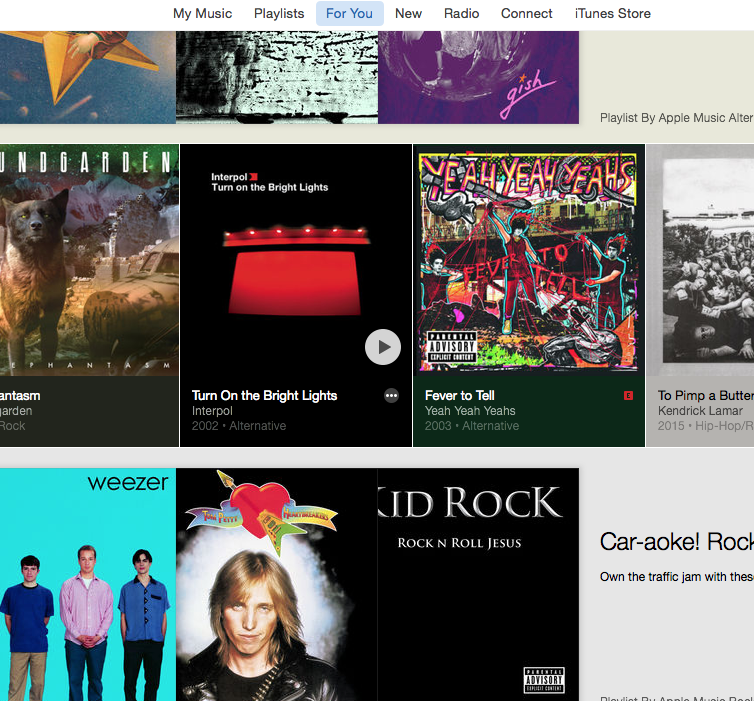 That said, Apple Music is conceptually the service I’ve been waiting for since I started using Rdio back in 2009. Apple really nailed almost everything I asked for in this blog post, and I anticipate things to get ironed out over the next year. Apple has the best curation/discovery tools, Beats 1 is way more compelling than I thought, they kept their Match service and integrated it, and even allowed Smart Playlists to work with their streaming music. It’s not perfect, but so far I think this is the service I’ve been waiting for. I’ve already cancelled my Spotify subscription and I can’t really envision a scenario that has me going back. Once I’ve had a month or two with the service I’ll dig deeper and report back.